In this post I think about the impostor syndrome, how it relates to me, and one of the possible causes. I’m in Las Vegas for the first SAP TechEd event of 2018 which starts in earnest tomorrow. Last night, I listened to an episode of my favourite radio series – the original Hitch Hiker’s Guide To The Galaxy by Douglas Adams. I remember listening to the episodes as they were first broadcast on the radio in the 1970’s, and they’re still as fresh and enjoyable today as they were then. The idea was, according to the inventor of the Total Perspective Vortex, that the one thing you can not afford to have is a sense of perspective, a sense of how insignificant you are in the context of the entire universe. I was thinking about this on my run this morning, and how the promise of an amazing week of learning at SAP TechEd reminded me of a great article I read recently. Before pointing you to that article, I wanted to talk a little bit about how I see myself in the universe, or rather more precisely, in the SAP ecosphere. Not because I want this post to be about me – far from it. I want to talk about it because perhaps others might feel like this too, and it’s often the case that merely knowing that other folks have the same challenges can help. I often think that at some stage, people are going to find out that I actually have no idea what I’m doing. That I’m no good at my job, and that people will eventually realise that I shouldn’t be in the position that I’m in. I’m constantly thinking “how does he know that?”, “I wish I was as good as she is”, “I’m an idiot – I know nothing”, “someone is going to discover what I’m really like!”. There’s a fear that I’ll be eventually found out as a fraud, that I’m masquerading as someone who knows what they’re doing, when in reality I don’t. It turns out that this seems to be a common affliction, and is known as “impostor syndrome“. Certain industries seem to reinvent themselves on a regular basis. One notable example is the software industry, and the enterprise software space, with SAP at the helm, is a good example. It’s in the nature of software that ideas, approaches, techniques and concepts are constantly growing and changing. Yes, there are ideas that come round again and again, some that come in and out of fashion, but in a lot of ways, many software layers that we’re building and approaches that we’re discovering or inventing today are those that are built on layers and approaches that we only discovered yesterday. This means that the learning cycle is constant, and events like SAP TechEd are regular intense triple espresso shots of learning condensed into a short (and sometimes overwhelming) space of time. I can see how the nature of our industry in particular is reflected in these short cycles of learning and working. In the article you’ll see how this contrasts sharply with the more traditional “guild” style of career where one starts as an apprentice, working towards becoming a master, and then becoming obsolete, after dedicated and focused decades of work. So when people ask me what I do, I often reply, somewhat flippantly, but truthfully, “I learn“. In the years since I started hacking around with SAP software back in the 1980’s, I’ve found myself having to constantly reinvent myself. In many ways that’s very enjoyable, but it comes with the challenge that I often feel inadequate and that someone is eventually going to realise that I am. So perhaps my impostor syndrome is partially caused by the act of attempting to keep up, of striving to understand new concepts and relate them to existing ones, as I travel on my learning journey, which, owing to the nature of our industry, will probably only end when I retire. So I’ve “outed” myself, and in a funny way I don’t know what the effect that will have. There’s a part of me that’s worried that people will think “Aha! I suspected all along that he was an idiot, I was right!”. But mostly I hope that this might resonate with others, and for them to realise that it’s neither unusual nor a bad thing – just perhaps a side effect of (certainly not helped by) the nature of what we do. If you’re at SAP TechEd this week, remember that the overwhelming combination of feelings – wonder, confusion, excitement, bewilderment – is part of the process and not unusual. And remember that there’s at least one other person who’s experiencing these feelings – me. I enjoy SAP TechEd very much and while my default state is always “I’ve no idea what I’m doing”, the event, and the people at the event, help me to join the dots a little bit more. This post was brought to you by a warm pre SAP TechEd morning in Las Vegas and some coffee from the hotel that was only just “OK”. Great post as always, it made me re-consider that importance of working with a team. Also made me think about how, when I didn’t have a very supportive team that thrived on sharing information, I relied heavily on SCN to provide that for me. Your “team” doesn’t have to be the one you work with at your company! Enjoy TechEd and all the learnings that come from it. Hey Chris, thanks for the comment. You make a great point – often we learn better in teams, or at least the support we get from other people is a great foundation for learning, even if that is ultimately alone. Learning by speaking to other people and hearing their take, their perspective on things is another great approach, as is, of course (as you mention) learning by teaching / presenting. What a great blog and I can very much relate to your feelings. I am often overwhelmed in beginning of projects on how we can ever get to the end and also that people will find out that I’m just a few steps ahead of them. My tactic is to be honest and open about your abilities. Don’t oversell yourself and if you humble about your abilities, then you’ll get more confidence. My strong side is not my development skills, in fact I always tell people that I’m not a good developer, it excellent copier. But I think when you have a lot of “baggage” it’s easier for you to decipher the evolutionary next steps. However you can never dwell on your learnings and you need to constantly learn otherwise you will become obsolete. Cheers Jakob. Great advice, by the way – being honest about one’s abilities helps not only those you tell, but also helps you as an individual, as the brain power can focus on learning and doing, rather than coping with pressure that mounts due to incorrectly set expectations. I like the idea that the baggage does actually help – experience does count for a lot, and helps you make better judgements when your technical or detailed knowledge is missing. Nice blog post DJ, it reminded me of our discussion about the Dunning-Kruger effect a couple of weeks ago. I did some research on both effects (which seem contrary at first) and found this interesting medium post. It basically claims that you hop back and forth between both ‘states’ depending on your environment (which makes sense to me). In this spirit: I hope you (and everyone attending TechEd) will a great time and learn a lot of new things there! Thanks Marius – I do indeed remember enjoying that conversation. I’ll definitely check out that post you link to – so much to learn, so little time! Thanks – we’ll enjoy TechEd, I’m sure. Lots of learning and sharing ahead! If anyone reading this is at SAP TechEd Las Vegas this week, come by the Developer Garage and you may have a chance to meet DJ in person. Thanks for sharing this, as others have said, if you of all people suffer from this, then there is no hope for the rest of us. I have for many years aspired to your level of mastery, however if even then I will still feel like in one slip up away from being rumbled, then what hope is there? I’d be curious to know if in any of your reading and learning around this you or others have come across ways to tackle the feeling that is at best unhelpful and at worst a barrier to putting yourself out there and trying what you are more than capable of. Thanks again for this and the rest of the series, I read them avidly each Monday. Hey Ian, thanks very much for the comment! I’m not sure I have come across any techniques; I guess I just go “heads down” or “head on” into the unknown, regardless. In a way, it’s the only thing I can do. I do remember a time when I was on a longish project doing less technical work, and I could feel myself going “stale”. I liked that feeling less than feeling like an impostor, so I changed gear and got going again. One thing is for sure though, adding a sharing aspect to learning does help generally – whether that’s in large events like SAP TechEd or smaller ones like SAP Inside Tracks, or even at more local and regular meetups. This is feeling that pervaded me since high school. The feeling to not be prepared or to knot know enough compared to other friends or colleges. It’s not like feeling humble, it’s something different. Thanks for your thoughts, Emanuele. I think you’re spot on about it not feeling like being humble, it is certainly different to that. To the way you see this as an opportunity – I say bravo. That’s definitely a glass half full approach and it’s helped me too. Something to learn each day – now there’s a thought to bear in mind. Very true. Secondly… IS. OMG. Yes. Yes. Yes. I think everyone gets it and thank you for sharing your thoughts. An honest to God post. It’s a topic most of us (me) tend to hide, not talk about it or try our very best to conceal it. You just showed that it’s alright to open up about it. It’s only human to have such voices in our heads while doing what we do. Peace, strength and learning to all. Thank you for the post DJ. Cheers Ali, your comment makes my post worthwhile. Thank you. I think you did a great and really good service for the Community by writing this. It is really courageous and sincere to open up on how you feel about being always learning. For many people, it is something hard to do because they are afraid of being seen as unprepared. I want to say that I also deeply identify with these feelings. I’ve begun programming when I was 15 and now, almost 25 years later, I always keep challenging myself to learn something new everytime I start to be comfortable. The price to pay is to be in a permanent learning mode, always feeling that there is more work to be done. And we know it will never end or, at best, will only when and if we decide to retire. The absolutely amazing upside of it is that feeling of “hey, I am capable of learning anything I put my energy and time into”. This is a point-of-view worth sharing. Thank you for that! Hey Douglas, thanks for this great comment. Absolutely. And I like the idea that in fact it’s a definite positive – knowing that you’re capable of learning things is a good feeling. Indeed, “learning” is a skill to be learned (and mastered) itself! I followed Coursera’s Learning How To Learn course a while back, I can recommend it. Alright, lots of folks write that they relate to what you wrote and share the experience of doubt about their qualification to do the job they are supposed to be doing. I get that. And there are tons of blog posts and videos of talks out on the internet where more or less well-known people in the IT industry declare that they also “have impostor syndrome”. But I wonder: what would it take to help the ‘imposter syndronauts” to not feel like they are faking their way through? If there was an annual acknowledgement where each and every “properly competent IT professional” get a pat on the back and a little medal to show that s/he is actually a professional that “knows the stuff”… would that make this feeling go away? And instead of the medal, you get money? Yep, that’s the salary people get for working. The argument that IT develops so quickly and it is difficult to keep up (especially when one does not actually invest time, effort and probably money to do just that – keeping up and learning) is absolutely true. While there are plenty of recurring trends and big ideas, there is a constant stream of new things to know and getting used to. But how is that different to any other profession? If you learned your job as a car mechanic in the early ’80s you can still do your job today – on cars from the ’80s, that is. If that mechanic has skipped all the vendor training since then chances are that she or he won’t do much good with a broken down Tesla. It is not too difficult to see how that can be applied to very many jobs. Now, do all of those professionals suffer from permanent self-doubt about their qualification to do the job? I can’t know for sure, but I doubt it. Most professionals have to attend regular training. If a car shop wants to be able to work on AUDIs they need to do the training. If a nurse wants to work in ICU, training is required. When a bus driver should take on a new route with a bigger bus – training it is. In our industry, however, it appears to me that training has become something that has moved from the rather static forms (training session + certification) to a form where everyone needs to take care about him/herself. Take a minute and think about what your last required training has been. Mine was a legal training about GDPR processes. Yet, nobody stops you from presenting on bleeding edge technology from SAP or others from working on projects that can have a tremendous impact on society. Let me take yet another angle now and take in some of the other comments. New projects always come with unknowns, that’s the intrinsic nature of them so it is clear, that at the very first step not every detail of the final solution is decided and clear. But deciding those details and finding the solution is precisely what projects are about. Design, to use another word, is always a process of steps, recurring phases, and refinement. 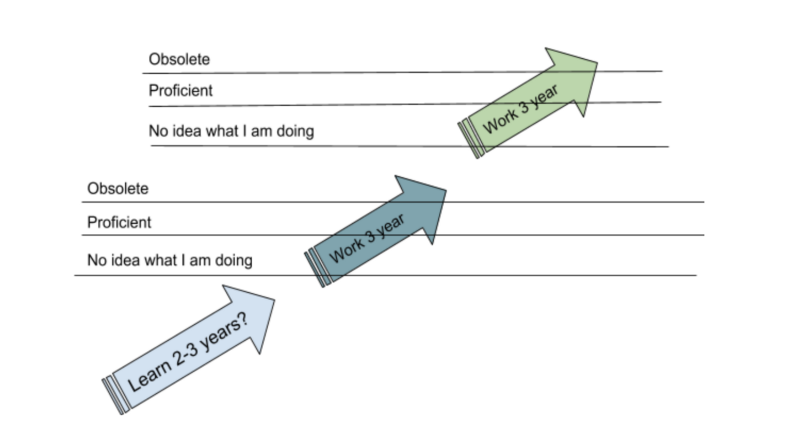 To avoid feeling lost at any stage of the process, there exist many tools, like a project plan for example that maps out activities over time and brings the future into the current consideration. In other words: being at the start of the journey does not make you an inadequate traveler. Especially not, if this is not your first trip ever. But: learning and becoming sufficiently competent with the processes of how IT projects are done is just as important as knowing how to use the development tools correctly. Was that feeling there when the well-paid job was accepted? Did it stop from negotiating a good salary/consulting rate? Or was there, right next to the “impostor feeling” also a strong-enough believe that it will work out and that the work to be done will be worth-while? I am pretty sure there was. (otherwise, yes, that would make that person an impostor, flat out). I’ll end my comment by addressing the point of “there are so many better folks out there”. Of course, there are people with more experience and know-how around and of course, they are often a lot more visible than the many other people with less expertise. Our industry, IT, has been growing more and more for many decades. Every year, more people start in IT than the year before. Conversely, that means, there are always more people with say, less than 5 years of experience than there are with more than 5 years. And the very reason for why there are so many new people coming in is that the demand for people that can do IT jobs is still growing. That means that all those super-experts are already “taken” out of the pool of competition. It simply does not make sense to think “Oh gee, that UI5 super guru can do things so much better than me – my company should rather hire someone like her instead” when it is very clear that the company was not able to get somebody like the super guru, since you have got the job. I hope I was able to point out clearly enough that there are very good reasons for not feeling inadequate and for not feeling lost or as if you are just “faking it”. That is not being arrogant about one’s own abilities but about taking a fact-based “inventory” of what one can and cannot do. What a wonderful comment, thanks Lars. I really appreciate you taking the time to share your thoughts. I won’t try to address each and every point, but want to pick up on a couple of things. You mention salary as a “medal” or a “pat on the back”; while I can see the analogy, I’m not sure it helps with the syndrome, all told. At least speaking from my perspective. In some ways it adds to the problem (in a nice way, I guess). Your parallels with car mechanics is interesting – what stands out for me is that if the comparison was accurate, we’d have cars of many more different shapes, sizes, in different dimensions (than 3D), working on different planes and doing completely different things from one another, with engines that may only be theoretical or abstractions of designs on paper, that changed as you looked at them and depending on who else was working on the engine at the same time. We’d also have new things coming down the line for us mechanics to work on that looked nothing like, in any way, anything we’d seen before. Not only that, but the requirements for success would depend on the maintenance of the car, the construction of the highways, and the composition of traffic laws, amongst other things. I don’t want to paint a “our profession is harder than yours” picture, but I do find the comparison somewhat limited. You mention there are good reasons, that you’ve pointed out, for not feeling inadequate. I get that, and logically some of your reasons make sense. But (again, speaking for myself) logic is not always everything.